← Apple Pencil — Better Than Pen & Paper? February – the month of love, hearts and roses. When you think about this month, you’ll immediately think of romantic dates and flowers from your significant other. However, Valentine’s Day is not just for couples. It is the perfect opportunity to enjoy this day with the whole family. After all, this day is a celebration of love. Begin a family tradition with these ideas for a fun filled Valentine’s Day celebration with your spouse, kids and grandchildren. • What better way to show love than to cook for them? Sharing a meal together is a great way to for the whole family to bond. 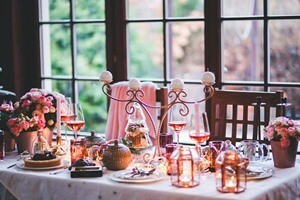 For the families who still live together (or near to each other), you can prepare a Valentine’s Day-themed breakfast. Heart-shaped pancakes, heart-shaped cookies, heart-shaped omelets… heart-shaped everything! • Host a Valentine’s dinner for the whole family at home or have it in one of your favorite restaurants. Your children can bring their significant others and celebrate Valentine’s together like a Family Group Date. You can also end the day with a movie or game night with the whole family. • If you live far from your kids and grandchildren, you can still send them chocolates and Valentine’s Day cards to remind them that they are remembered and loved. • For the Dads, no matter how old your daughters are, don’t stop sending them flowers. A father is still and will forever be a daughter’s first love. • Spread the love on Valentine’s Day by caring for others. You and your whole family can start a tradition of reaching out to others and helping out the needy during Valentine’s Day. Bake some treats and deliver them to local shelters and assisted living facilities, as well as children’s hospitals and nursing homes. This is a great opportunity to show love to others and make their day extra special. Sounds very fulfilling, right? This entry was posted in Children, Relationships. Bookmark the permalink.